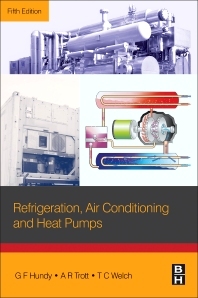 Refrigeration, Air Conditioning and Heat Pumps, Fifth Edition, provides a comprehensive introduction to the principles and practice of refrigeration. Clear and comprehensive, it is suitable for both trainee and professional HVAC engineers, with a straightforward approach that also helps inexperienced readers gain a comprehensive introduction to the fundamentals of the technology. With its concise style and broad scope, the book covers most of the equipment and applications professionals will encounter. The simplicity of the descriptions helps users understand, specify, commission, use, and maintain these systems. It is a must-have text for anyone who needs thorough, foundational information on refrigeration and air conditioning, but without textbook pedagogy. It includes detailed technicalities or product-specific information. New material to this edition includes the latest developments in refrigerants and lubricants, together with updated information on compressors, heat exchangers, liquid chillers, electronic expansion valves, controls, and cold storage. In addition, efficiency, environmental impact, split systems, retail refrigeration (supermarket systems and cold rooms), industrial systems, fans, air infiltration, and noise are also included. Guy Hundy has extensive experience in the design and application of refrigeration compressors. Previously Director of Application Engineering with Copeland Europe and a Past-President of the Institute of Refrigeration, he has particular expertise in the field of compressor performance and efficiency in commercial refrigeration, air conditioning and heat pumps. Hundy is currently Director at Aleph Zero Ltd a refrigeration and cooling optimization consultancy.